… almost all cases the risk of rupture is less than one percent, even after multiple sections, or special scars such as an inverted T. The risk is roughly double what it is for an unscarred uterus, but considering the tiny numbers it doesn’t really make a difference, especially since the vast majority of ruptures are not catastrophic in nature, something that is not differentiated in study results. Then later in the day, I came across a comment on a midwife’s website saying that “research shows” the risk of uterine rupture doubles after a cesarean. How does a prior cesarean impact uterine rupture? Both of these representations of uterine rupture after a cesarean are incorrect. The risk of a uterine rupture does much more than double after a cesarean. The risk of uterine rupture increases 91 times after a cesarean. That’s the truth. But this is also true: this 91 times greater risk does not mean that the risk of uterine rupture is so large in a scarred mom. It simply means that it’s so very, very small in an unscarred mom. So how we communicate these statistics impacts how they will be received. Do we center how the risks compare – the relative risk – and talk about the 91 times increase? Or do we focus on how often uterine rupture occurs – the absolute risk – and emphasize the 0.64% risk? I believe that information is power and the more information parents have, the greater their ability to make informed decisions that feel right for them. So it’s important to talk about both. Parents should understand how their cesarean impacts their future uterine rupture risk. And they also need to understand that this increased risk is still similar to other obstetrical emergencies even first time parents can experience. The risk of uterine rupture is just one of the many factors that parents must learn about and consider in order to make an informed decision on whether they want a VBAC or a repeat cesarean. This is why the American College of OB/GYNs describes VBAC as a safe and reasonable option and encourages parents to have access to it. The truth is, both modes of delivery have small risks associated with them. Parents can only decide which set of risks and benefits are acceptable to them if they actually know the facts. Knowing solely about the risk of rupture does not give them a full picture. 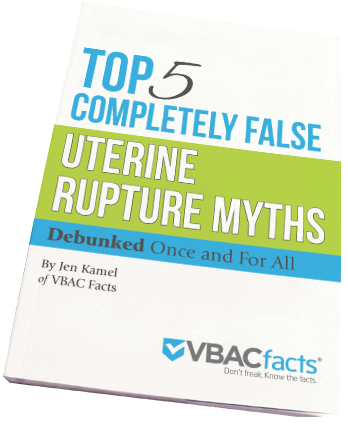 That’s why I created “The Top 5 Completely False Uterine Rupture Myths.” This free report debunks the top uterine rupture myths so you can help your clients bob and weave their way through the misinformation and towards a truly informed decision. Click here to download this free report. Landon, M. B., Hauth, J. C., & Leveno, K. J. (2004). Maternal and Perinatal Outcomes Associated with a Trial of Labor after Prior Cesarean Delivery. N Engl J Med, 351, 2581-2589. Zwart, J. J., Richters, J. M., Ory, F., de Vries, J., Bloemenkamp, K., & van Roosmalen, J. (2009, July). Uterine rupture in the Netherlands: a nationwide population-based cohort study. BJOG: An International Journal of Obstetrics and Gynaecology, 116(8), pp. 1069-1080. Hello, my name is Trish. I have had 3 cesareans all 4 years apart. I am not pregnant now but I know I want another baby. Not only another child I want to experience a vaginal birth too. I always did but after my first c-section, because of a breech baby, I was always advised to get another c-section. I can have only but so many c-sections before that becomes too high risk. I just want to try the natural way with no meds at all. Realistically speaking, do you think that is possible from your professional standpoint? VBA4C is possible, but the risks for you specifically are based on several different factors which you should review with a medical professional. Are there providers in your community that attend VBA4C? (Click here to learn more on how to do that.) I recommend making an appointment with them to discuss your situation. If you can, get a copy of your operative report from each of your cesareans for them to review. Many people who want a VBAC after multiple cesareans find that they have to travel, especially if they want a hospital birth. If you are able to do that, you have more options. The risks of pregnancy do increase with each prior cesarean and the risks of a VBA4C are different than the risks of a fifth cesarean. Ultimately, you have to consider the risk/benefit of a VBA4C to a fifth cesarean and decide what is the right decision for you. I do cover the evidence on VBAC after multiple cesareans and repeat cesareans in my online program for parents. If you want to get up to speed quick, click here to check it out. Evidence on vbac after multiple csection link isn’t working 🙁 I was looking for the same info as I am trying my hardest to safely avoid a 4th csection come April 2018. I know I’m replying really late to this comment but it is VERY possible to have a VBA3C; depending on the reasons for your prior sections of course. January 2017 I gave birth to a 9lb 8oz girl who was a VBA4C; I had never had a vaginal birth prior to her. My very first section was due to failure to progress but I was induced and not allowed to move from the position in the bed so i feel that is the reason I was not able to progress. My 2nd section was an attempted VBAC but due to lack of support I got scared and gave up. The other 2 were due to my providers and my lack of courage to stand up for myself and what I wanted. This time was different; I was very determined and you have to be because so many providers are against it. I had a Dr stay 2 hours past her shift to see if I would be successful!!! I am now pregnant with twins and looking to have another VBA4C but I know it’ll be harder this time as I’m also having a hard time finding any info on twins after a successful VBA4C. I just wanted to let you know it can be very possible and I wish you good luck and I really hope you find a supportive provider instead of having to fight them. Hi Trish and Jen. Trish, I am in the same position as you. 3 cesareans and I’m wanting a natural birth for my 4th (trying to conceive, not pregnant yet). I have my operative reports for all 3. Is there anyone in Toronto, Canada that can help me figure out my individual situation so that I can make an informed decision on my birth choice? Hi Jen, thank you for all your explanations and research. I am finding it very helpful. I cite the same research ACOG did in their 2010 guidelines on short birth intervals which you can access here. Keep in mind that this research is rather limited which is why ACOG says that women with short birth intervals are still candidates for VBAC. If you would like someone to walk you through the evidence on birth intervals, I cover that and so much more here. I was wondering if you have any information on the risk of uterine rupture after myomectomy as it compares to VBAC? I had a 3.3cm intramural fibroid removed from the fundus. My uterus was not cut all the way through though it was deeply embedded. It seems to me that VBAM is even more discouraged than VBACs. Why is this? Is it because it was a vertical incision? This is confusing to me because it seems like a vertical incision on the body of the uterus is completely different than an incision on the top of the uterus. I have also heard that it may be because contractions originate from the fundus. But if that is true wouldn’t it mean that the intensity of the contraction builds to the lower part of the uterus. From the medical literature it looks like the lower part of the uterus is where rupture is most often seen, and it isn’t always along the c-section scar. I have tried to find actual experiences of women who have experienced rupture but the only ones I have found were not during labor but rather several weeks prior to when a c-section would have been scheduled. So no matter what they wouldn’t have avoided a rupture. If your scar holds up until the point of TOL, wouldn’t it stand to reason that its integrity has been sufficiently proven to make a TOL an option just as much as C-section? Myomectomies vary a lot person to person due to individual circumstances. Your best bet is to review your operative report with a few VBAC supportive doctors/midwives in your area and get their opinion. The lower part of the uterus is where most ruptures occur in scarred uteri because the rupture is occurring along the cesarean scar. Among the very rare uterine ruptures in unscarred women, ruptures occur all over the uterus. While uterine rupture can occur before labor begins, it’s exceedingly rare. Over 99.95% of ruptures occur during labor. Read more here. So labor does put more stress on the uterus and if there is a weakness in the uterus, like an existing scar, that increases the risk of uterine rupture. That’s why even though scarred uteri hold up during pregnancy, there is an increased rate of uterine rupture in comparison to unscarred uteri. This is an area of unknown risk because not every combination of myomectomy scars have been studied in terms of uterine rupture. So, I recommend talking with some doctors/midwives in your area and getting their opinion. PS – If you would like to talk to other women who have had myomectomies, come post a question on the VBAC Facts Facebook page. Can you direct me to information that forms the basis or supports the thinking that vertical and classical incisions are at a higher risk for uterine rupture than low transverse? I have searched and searched but the only info that I can find just makes the statement that they are riskier and doesn’t direct to any studies or concrete evidence. I think the risk is generally stated as approximately 9%. Just wondering where this is coming from. Classical (high, vertical) incisions go into the upper part of the uterus which does all the work during labor. The thought is, if that upper part (the fundus) is cut, it’s more likely to rupture during labor. Very few women have classical incisions, so it’s been insufficiently studied which means we don’t have super great numbers quantifying the risk of rupture among these scar types. ACOG says that parents with classical incisions are not “generally” considered candidates for VBAC. Low vertical incisions are OK for VBAC per ACOG because they are in the lower uterine segment which is associated with lower rates of uterine rupture. If you want to dig deeper, I cover this in great detail and so much more in my online workshop for parents. I was directed to you by Rebecca, because I in really in need of vbac support.. I am living in Germany, and NO care provider, hospital or midwife will allow me to have a vba3c. I am currently nearly 15 weeks pregnant after having 3 completely unnecessary, very traumatic cesareans. I just had a meeting with the most progressive hospital for birth in the city.. They will even allow a vba2c, but not 3. They stated the risk then becomes so much higher for rupture.. Even though the dr. said in her own words “the risk is low” she also said my scar looks great, and the placenta is not anywhere near the scar.. I am being forced into having a repeat cesarean or having a UCa3c, which I really dont feel comfortable with.. Is there any way you could help me with ideas or help or even connect me with someone here in Germany? I have been searchng for 10 weeks with no luck.. I feel frustrated and lost.. Thank you.. I have posted your question here and here. Hopefully someone will have a referral for you. So I’ve been going back and forth on what to do about my labor and delivery with #2. I’m 5 months along. I had my first 2.5 years ago. Was supposed to be a midwife attended home birth. We had to transfer and I ended up having a CS with a J incision (he was OP and over 10 pounds). I can’t really find an OB who will assist in vbac and I’m cautious about HBAC with midwives. This article is kind of scaring me into the “schedule the surgery” zone. I wrote this article to debunk the oft repeated myth that the rate of uterine rupture doesn’t change (much) after a cesarean. While the risk does increase greatly, this does not mean that the risk of uterine rupture is excessive during a VBAC nor that VBAC is dangerous. When women believe that the risk of uterine rupture during a VBAC is similar to an unscarred mom, they are not able to make an informed decision about their birthing options. Women are entitled to fair and accurate data and that is what this article is about. The risk changes with a J incision. The research on “special scars” (which include classical/high vertical scars, J & T incisions) is very limited. We have a handful of studies reporting a wide range of rates. Further, these studies included small sample sizes and did not control for important factors such as induction and augmentation. So we really don’t know that the risk is for women who want to VBAC with a special scar (also referred to as a VBASSC.) Any woman planning a VBASSC must weigh the unknown risks of VBASSC with the known risks of multiple repeat cesareans and factor in her intended family size. ACOG says that women with special scars are not “generally” candidates for VBAC and thus they leave the door open for women who do want to VBASSC. There are hospital based care providers who attend VBASSC but they are few and far between and you may have to travel in order to birth with them. Birthing at home comes with less rules, less regulations and more freedom to birth how you want, but carries its own set of risks. This is a decision that you can only make for yourself. As you collect information, be sure to ask for sources when people give you statistics. Unfortunately, there is a lot of misinformation on the internet which is what fueled my whole Birth Myths,m series. What area are you in? Perhaps I can post on Facebook to see if possibly there is a care provider in your area who you have not yet talked to. Do you know what the UR risk is for an unscarred mom while on Pitocin? Ah yes, that is another persistent myth – that an unscarred, induced mom has the same risk of rupture as a scarred mom. The risk of rupture in an induced, unscarred mom is about 1 in 4,500 – still pretty darn rare. Read more here. I just want to say- just because there is a very low percentage of those who rupture- trust me you do NOT want to be the one it happens to. I had my 4th child. No previous sections. My uterus ruptured, placenta separated, and bladder was ripped in HALF!!!! My surgery consisted of a hysterectomy (after doc tried to save my uterus), 4 units of blood, bladder repair, suprapubic catheter for 7 wks and i did not get to see my baby for 9 days. NOT ONCE!!! He was pulled out just in time, he was not breathing and had to be intubated. He was careflighted to another hospital. I was told he would have brain damage. Thankfully we both miraculously healed and have NO lasting effects. Most women with ruptured uteruses alone dont come out this well. But dont poo it off as just docs trying to scare you. These are SERIOUS complications that can happen. and it typically happens from a previously scarred uterus. If you wish to risk your childs life, thats your business, but its not something to be taken lightly. I am so sorry about your rupture and the fact that you were unable to see your son for so long. I’m glad the doctors acted quick and that you and your son have no long-term complications. Who is poo-pooing the risk of rupture? Perhaps you’re unfamiliar with this website: https://www.vbacfacts.com/2012/12/07/some-people-think-im-anti-thispro-that-my-advocacy-style/. I have discussed uterine rupture at great length: https://www.vbacfacts.com/category/vbac/uterine-rupture/. I am not someone who poo-poos risks. In fact this article was written in response to the urban legend that rupture rates don’t vary between scarred and unscarred moms. This myth, which this article debunks, very much minimized the risk of rupture. Are you suggesting that all women have cesareans to circumvent unlikely and unpredictable events like uterine rupture or placental abruption? Cesareans come with their own risks: https://www.vbacfacts.com/2012/12/09/why-cesareans-are-a-big-deal-to-you-your-wife-and-your-daughter/. So to suggest that VBACs are only for women who choose to risk the lives of their children is inaccurate. Yes, the risk of rupture in an unscarred woman is extremely low, but that does not mean it is zero. That is not minimizing the risk. That’s simply a statement of fact. I am sincerely sorry you were the statistic. Also in regard to your comment. “I don’t know how someone can confuse the risk of infant death with the risk of uterine rupture.” The general public believes that uterine rupture equals infant death 100% of the time. That is the first myth that needs to be dispelled! Zwart (2009) looked at 25,989 deliveries after a cesarean and found 183 ruptures giving us a 0.64% uterine rupture rate or 64 per 10,000 deliveries. 72% of those ruptures occurred in spontaneous labors. Of the 183 ruptures, 7.7% resulted in infant deaths representing 14 babies dying. This gives us a rate of infant mortality due to uterine rupture after a cesarean of 0.05% or 5 in 10,000 deliveries. Okay, so if 72 % of those ruptures (132)occurred in spontaneous labors, how many of the 25,989 woman had spontaneous labors and what is the rate of rupture for spontaneous labour during VBAC? Conversely what is the rate of rupture when a VBAC TOL is induced or augmented? 51 over what? I’m also intersted in the method of induction, but I understand that information wasn’t available. Zwart did not provide the number or percentage of women who had spontaneous labors vs. induced labors. In trying to find how many labors are typically induced in the Netherlands, I found a study which stated, “In The Netherlands induction rates have remained stable over the last decade at approximately 15%” (Verhoeven, 2009). Since the induction rate has been stable, and this study included 97% of births in The Netherlands between August 1, 2004 and August 1, 2006, I felt comfortable using this 15% rate of induction to calculate the rate of uterine rupture in induced, unscarred women. Read more about induced, unscarred rupture vs. scar rupture. I would love that data too. Unfortunately, for whatever reason, Zwart did not break out the data in that manner. Zwart utilized multiple methods of induction: cervical prostaglandins (sulproston, dinoproston, and misoprostol aka Cytotec), oxytocin (Pitocin) and mechanical dilatation. Prostaglandin “dosages ranged from 0.5 to 2.0 mg with a minimal interval of 4 h in between,” but they do not provide the dosages of the women who ruptured. You can always email Zwart and ask these questions! Please share any additional information you receive! ok here is a question i really need to ask. I have had two c sections within 2 years (jan 2010, and Feb 2011). I have two different scars because they had to cut higher the second time around. I dont plan on having another kid anytime soon but you know how things tend to go. I hope this made sense on what I was trying to ask. The reason for the second section was because I gave in and the doc wanted me to have a section (to cover his but more than anything) I had gestational diabetes and because of that the doc didnt want me to go full term. I honestly dont know what to think. And I think its messed up that because of an idiot doctor with my first child I am now almost FORCED to have csections for the rest of my kids and now i am LIMITED on how many kids that MY body can have. I’m so sorry your OB wasn’t supportive of VBAC, but your repeat CS might have been necessary due to your gestational diabetes. The best way to know is to get a copy of your medical records and operative report for both surgeries and schedule some consultations with 2-3 VBAC supportive care providers to get their opinions. You might have to meet with more in order to find someone truly supportive. Here is a list of questions to ask them (https://www.vbacfacts.com/2009/06/06/interviewing-care-providers-questions-to-ask/) and ways to find them (https://www.vbacfacts.com/2008/03/08/finding-a-vbac-supportive-ob-or-midwife/). Just be aware that there are a lot of OBs out there who say they are supportive of VBAC, but really aren’t (https://www.vbacfacts.com/2008/04/13/the-three-types-of-care-providers-amongst-obs-and-midwives/), so getting referrals from women who have successfully VBACed is a good way to find a VBAC OB. Read more on planning a VBAC here: https://www.vbacfacts.com/2009/01/15/im-pregnant-and-want-a-vbac-what-do-i-do/. In terms of birth intervals, we really need larger studies to give us some definitive evidence. Read more here: https://www.vbacfacts.com/2011/11/11/birth-intervals-uterine-rupture/. I think what you’re seeing here is the retelling of information given at the VBAC symposium at the National Institutes for Health last year. There were clearly worded statements made by researchers and physicians stating that what they analyzed showed that there were not significant differences in the outcomes of first time mothers, VBAC mothers, or mothers birthing vaginally after multiple cesareans. I don’t have the studies to which they referred, however; you can go to the NIH and review their information presented during those days of discussion. I was at the NIH VBAC conference. It was awesome and there was a lot of great information shared. However, no one ever said that the risk of UR in a VBAC mom was “similar to” or “double” the risk of an unscarred mom. There is not one piece of research to support that false claim. You can watch all the presentations from the NIH here. I believe the study you are referring to was the Smith (2002) study which I have listed in my bibliography. Smith stated the risk of infant death during a VBAC attempt is “similar to the risk” of infant death during the labor of a first time mom. I don’t know how someone can confuse the risk of infant death with the risk of uterine rupture. I hope you will help me in dispelling this myth by forwarding this article to anyone who repeats it! This is so, so important. Women need FACTS, they don’t need to be told what they want to hear! Thank you for highlighting this.